Select the thin, green-stalked variety (English Asparagus) for this soup. It serves 5-6 people. 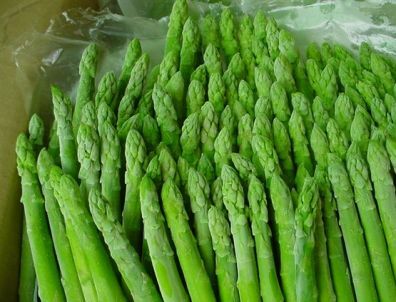 Wash the asparagus well and holding the bunch so the tips are all level, slice off the tips. Place them in a bowl. Cut the stalks into sections and place in a separate bowl. Place 1 cup of the water or stock, one quarter of the salt, and the asparagus tips in a 4-litre/quart saucepan. Simmer for 4 – 5 minutes or until tender. Remove the tips and place them in a bowl, keeping the cooking water in the saucepan. Place the asparagus stalks, the asafoetida, and the celery in the same saucepan. Covered and simmer over moderate heat for 15 – 20 minutes or until the vegetables are tender. Remove the saucepan from the heat and pour the contents through a sieve. Keep the reserved liquid and squeeze the vegetables through the sieve, collecting the puree in a separate bowl and discarding the dry residue in the sieve. Melt the butter in a saucepan over moderate heat, add the flour, and slowly add the reserved asparagus stock over low heat. Stir until the soup thickens. Add the vegetable puree, the rest of the salt, the pepper, and the asparagus tips; stir well and heat until almost boiling. Stir in the cream. Serve the soup in pre-warmed soup bowls and garnish each serving with a light sprinkle of paprika.